I was so excited to be invited to an amazing doughnut workshop by Doughnut Time to celebrate their collaboration with Soap&Glory and the launch of the limited edition Soap&Glory doughnut! Doughnut Time creates and sells amazingly creative doughnuts. Originally started in Australia, there are now several Doughnut Time stores in the UK. 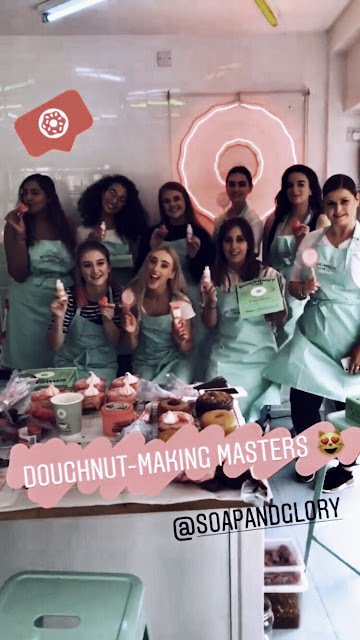 I have been meaning to visit a Doughnut Time at some point to try their delicious treats so I was so excited to be invited there to create my own Doughnut Time doughnuts, and to create the exclusive Soap&Glory doughnut! Soap&Glory create the most amazing bath time goodies, and their products have been a staple in my daily shower routines for years! In particular their Clean On Me Shower Gel, Scrub Of Your Life Scrub and Righteous Butter Body Cream - they all smell so incredible! So exciting news! Soap&Glory have collaborated with Doughnut Time to create a delicious, and very pink (of course) Limited Edition Soap&Glory Doughnut which will be available to buy from all Doughnut Time locations across the UK this weekend only! The most amazing news too is that not only do you get to enjoy a yummy and beautiful doughnut, but you also receive a bottle of the Soap&Glory Clean On Me shower gel too! The below image is the Brand New Limited Edition Soap&Glory Doughnut Time Doughnut! If you've ever wondered how Doughnut Time create their crazy doughnuts, Doughnut Time run workshops where you can learn how to create some of their popular creations as well as being the opportunity to be creative by decorating your own unique doughnuts! I was lucky enough to be invited to one of these workshops with Soap&Glory! The first doughnut we were shown how to decorate was the No Share doughnut. The No Share has a dark chocolate glaze with Ferroro Rocher popped in the middle and topped with a crumbly mix of roasted hazelnuts and feuilletine! The next doughnut we created was the most popular Doughnut Time doughnut; the Nutella filled Love At First Bite doughnut! First of all we covered a whole doughnut in a sugar and cinnamon coating. Then we hollowed out the middle of the doughnut, and used a piping bag to completely fill the doughnut with Nutella! It was then time to create the signature Soap&Glory doughnut! We took a light pink glaze and piped it across the top of the doughnut. Afterwards we piped the bright pink glaze on top in a dots and stripe pattern, and then used a palette knife to create a marble effect on top of the doughnut. Now it was time to create our own strawberry meringue kisses to go on top of the Soap&Glory doughnut! We watched how the meringue mixture is made, and then it was our turn to add the strawberry sauce and create our own meringue swirls. Then to finish off the Soap&Glory we added a fizzy strawberry - fini! Now it was time to freestyle! We could decorate our remaining three doughnuts however we wanted to. We could use any of the remaining glaze and could use any pick n mix available in jars around the workshop room, as well as some super cute Soap&Glory edible sugar logos! For my first doughnut I decided to go for a love theme (well I tried to anyway haha). I used the dark chocolate glaze as a base and then added on top a meringue kiss, a chocolate heart, a Haribo heart, a red lips sweet and a Love Heart sweet. I called this doughnut - The Sweetheart. I went a bit colourful and crazy on my second doughnut! I went for the bright pink doughnut glaze and topped it with sparkly sprinkles. Then I added a blue fizzy marshmellow, a lemon bonbon and a knotted up fizzy rainbow pencil - oh and of course I added the Soap&Glory sugar logo too! I called this doughnut - Eye Candy. My last doughnut. I'm ngl I was running out of creativity tbh so opted for something quite simple. I marbled the glaze of my doughnut with the dark chocolate and bright pink glazes, and then added pink and white sprinkles on top! Then I topped it off with a piece of fudge, a chocolate sprinkles heart, a strawberry bonbon and another Soap&Glory sugar logo. I called this doughnut - Oh Happy Glaze! I also received some lovely Soap&Glory goodies to take home too, and I can't wait to share and enjoy my doughnuts with my family tonight whilst watching Love Island! Thank you to Soap&Glory for the invitation and thank you to Doughnut Time for the amazing doughnut workshop! I will link below Soap&Glory's website so you can look through their wonderful bath time products, as well as Doughnut Time's website so you can check out their crazy doughnut designs that are available to buy, their store locations, as well as more information on joining in on a doughnut workshop for yourself! Most importantly make sure you purchase a delicious Soap&Glory Doughnut Time Doughnut available this weekend only! What was your favourite doughnut?